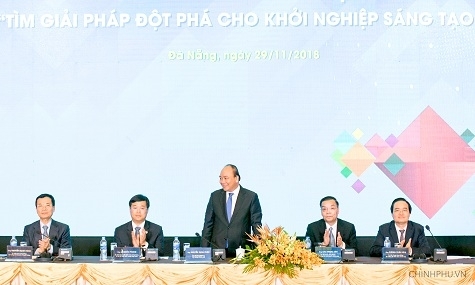 Prime Minister Nguyen Xuan Phuc committed all possible support to young businesses and startups in his speech delivered at the Youth Startup Forum held in the central city of Da Nang on November 29. PM Phuc lauded the Central Committee of the Ho Chi Minh Communist Youth Union and the Vietnam Youth Federation for creating a helpful dialogue channel among the PM, government members, and young intellectuals to seek effective paths to boost startups and innovative projects. The PM assigned relevant ministries and agencies to consider constructive policies and mechanisms to create a legal framework and a level playing field for up and coming startups. The Ministry of Science and Technology was asked to acquire startup ideas to submit to the PM. In the near future, the Government will assign specific tasks to ministries and agencies to create the best conditions for innovation to flourish, he said. Participants at the event discussed the strengths and shortcomings of young Vietnamese startups, the operating efficiency of support centres for startups and innovation projects in Vietnam, relevant policies and mechanisms, the national startup strategy with its pillars of high-quality human resources, big data, artificial intelligence, special national and local mechanisms in the field, financial and accounting mechanisms, and business requirements, among others. Representatives from the Ministry of Science and Technology, the Ministry of Education and Training, and the Ministry of Information and Communications updated participants on the policies and mechanisms in place to support startups, including measures towards further enhancing innovation in schools, connecting with enterprises, and proposing mechanisms that allow state enterprises to places orders for new, innovative products. According to a recent survey, Vietnam has nearly 1,000 startups projects each year, including small- and medium-sized enterprises and startup models.